Want a lifetime of healthy teeth and gums for your child? Food is a huge part of this equation. Your child needs a balanced diet for teeth to develop properly and to form healthy gum tissue. Equally important, you should limit certain carbs in your child’s diet, like sugar and starches, which significantly increase the risk of tooth decay. 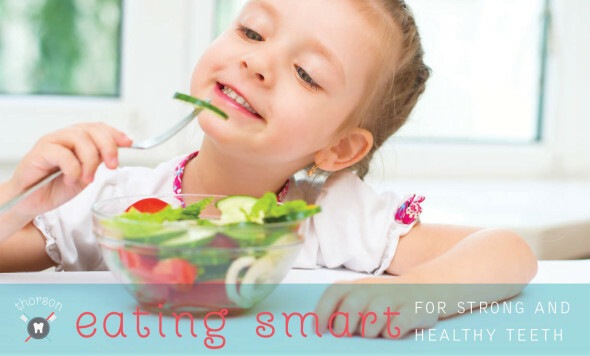 #1 – Stock up on healthier foods. A balanced diet includes a healthy mix of fruits, vegetables, grains, meat and beans, and milk. Fill your refrigerator and pantry with these kinds of foods instead of starchy and sugary snacks. Teach your child that “fun foods” are allowed on special occasions, but aren’t a part of their regular diet. #2 – Serve carbs the correct way. The goal is not to eliminate carbs from your child’s diet. Many of these foods provide essential nutrition. You just need to select and serve carbs wisely. It’s safer for your child’s teeth to eat sugary or starchy foods as part of a meal because other foods help to remove the sugar from the teeth. When your child eats sugary or starchy snacks, the sugar often remains on the teeth, which promotes tooth decay. #3 – Watch out for “hidden” sugars. Always look beyond the sugar bowl and the candy dish. Lots of foods contain one or more “hidden” types of sugar (even if they don’t taste sweet!). For example, did you know that peanut butter, ketchup and salad dressing are all loaded with sugar? You can expect these extra sugars in all processed foods, all milk products, many fruits, and some vegetables. #4 – No “bad bottles” at bedtime. If you have a young child, never put them to bed with a bottle of milk, formula, juice or sweetened liquid. During sleep, any unswallowed liquid feeds bacteria that produces acid and attacks the teeth. This can trigger severe tooth decay. Give your young child a pacifier or a bottle of water at bedtime instead. If you need any more advice about your child’s diet, you can always ask your pediatric dentist for help. Pediatric dentists receive an additional two years of specialized training in the needs of children and are very knowledgeable about foods and drinks you should choose – and the ones you should avoid.